When it comes to men’s sports watches, one of the most common recurring themes in the design of such pieces is how effectively they communicate an active lifestyle. There are, of course, many many ways to skin this cat. At one extreme, you have very stripped down almost minimalist watches that have just one feature. These watches work because of the weight and power of these units’ brand. On the other end of the spectrum are watches that are chock-full of measuring devices, read outs, and controls and buttons on the side. Think of these as all-in-one measuring devices that often don’t just measure the time but also deliver many other data points about the world around you. 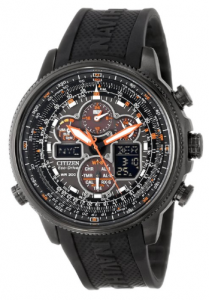 The Citizen Men’s JY8035-04E “Navihawk” definitely falls into this camp. The great thing about the JY8035-04E is almost nothing is left to your imagination. You get at least 6 different readings. Compass, chronograph, you name it. To top it all off, this unit is viewable at night thanks to its luminous feature. Finally, you don’t have to wonder about having to hike to town if you’re in the middle of the great outdoors to find a battery to restore the juice to your timepiece. Powered by the sun, this eco-drive powered sports watch is good for the long haul. Talk about convenience! If you are looking for a sleek, minimalist, highly subtle and versatile sport swatch that plays up the ‘luxury’ brand behind it, the Navihawk isn’t for you. It’s not all posing or positioning, it’s all about results. Many watch design purists might even dismiss the ‘packed’ look of this watch as ‘busy’ but that is precisely what you should expect from people who miss the point of sports watches. True sports watches are all focused on one thing and one thing alone: giving you the data you need to maximize your outdoor experience. In short, they have to be all about data and they have to do this within a compact platform and tight package. The Citizen Navihawk definitely does a good job of this. This unit has both an analog display and digital location readouts among others. It truly offers the best of both worlds-precision, multiple information points, and a solid compact design. Thanks to its Japanese quartz technology for movement, you are assured of smooth and efficient operation. If you want your friends and co-workers to see how active of a lifestyle you lead or that you prefer a rugged action-driven lifestyle, this watch hits the ball out of the park. Seriously. Not only is it packed with all sorts of measurements, everything comes together within a tight water resistant package. This watch has you covered up to a depth of 200 meters. If you are going diving or going camping near the water, the Citizen Navihawk should be at or near the top of your options. This watch is no joke. Given that it ships for the $487.50, it is also quite a steal for a watch of its class, feature set, and brand level. I really like the Navihawk (and Skyhawk) line from Citizen. With the Eco-Drive system and A-T (Atomic Time) the time keeping is pretty much fool proof. The watches are rugged enough for most of my used which are mountain biking, hunting, hiking, fishing, camping. And I actually find all the dials useful, I use the UTC for ham radio work, and the other dials are self explanatory. The watch looks confusing but it can all be used. Even if your unable to get enough sun or a time signal the watch will go and go. It has no compass or altimeter like a Pathfinder, but I found I wasn’t using those features and the Casio accuracy was variable. The only issue I have with the Navihawk and Skyhawk is the bracelet bands. My wrists swell and contract a fair amount as I travel about and the bracelets don’t have enough adjustments. I use the Citizen Proximity style band for both (23mm for the Navi 22mm for the Sky). The Citizen Proximity bands give me the adjustments I need, they are very comfortable, and look great especially since I choose bands that had stitching that matches the watch body. If you’re looking for a featureful watch that is very accurate and easy to maintain the Eco drives are great. I’d love a top dollar watch but the looks and function of the Citizen Eco drive AT are hard to beat. me with one this morning. I’m a Brietling Bentley guy myself but this watch says what it dose and dose what it says. The face may be confusing at first but as you look and read the manual you start to feel more at ease. This is a serious time piece,with everything you need to survive in the wild lands of the great out doors or the big city. Precise time thanks to the world time frequency as well as one of the best analog / digital readouts on the market today. This eco-driven time piece has a proven track record when it comes to reliability. For over 10 years of my personal reading and research into the citizen line of watches i must say this platform of sun powered watches has only gotten better and better. And now that i finally have one and exploring the features and wearing it just feels like a perfect fit. Hope more of you guys join the club! You wont be disapointed.